I love LUSH Fresh Handmade Cosmeticsbecause they have awesome products AND they are all natural! They carry skin care, hair care, bath and body care products that are made out of fresh organic fruits and vegetables, essential oils and ethically obtained ingredients from around the globe. Their products are 100% vegetarian and are NOT tested on animals. They also do not use wasteful packaging to further help our environment. This is a company that cares not only about their customers but also the environment. LUSH sent me a few different products to try that are perfect for Valentine’s Day. 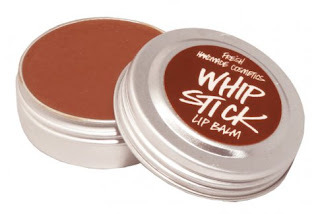 The Whip Stick Lip Balm in Sweet Chocolate is divine! It smells soooooo good and tastes even better. If you love chocolate, then you are going to want to try this one! It leaves your lips feeling kissably soft and is made from oat infused honey and shea butter. It is priced at $6.95. The Tisty Tosty Bath Bomb is heart shaped and smells like roses. Rose perfume is supposed to ease tension and stress and give you happy and positive feelings. I love to have baths and this was especially fragrant and relaxing. 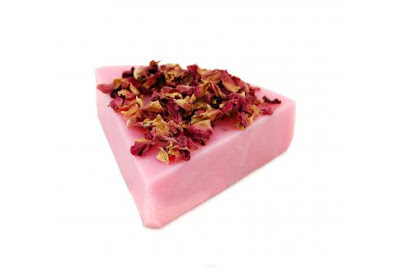 When you put it in the bath, it will fizz and the rose scent will permeate the air. As an added treat, there are rose petals in the bath bomb that will be released as it dissolves. Ohhhh I can feel the relaxation now! It is priced at $5.95. 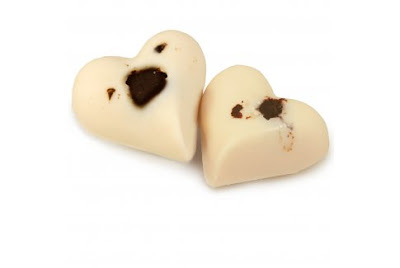 Soft Coeur Honey Cocoa Massage Bar is made from cocoa and shea butter with a soft, molten chocolate and honey center. Sounds good enough to eat now doesn’t it? You can use it to give a massage just by rubbing the bar in your hands and massaging into your partner’s skin. I used this on John on his back and loved the sweet scent. The smell is soooooo incredible!! It melts into an oil that easily absorbs into the skin. It is a little greasy, so you will need to wash your hands afterwards. At least your hands will be feeling soft and smelling delicious after using it! It’s a fabulous product and costs $8.35. The Ring of Roses Buttercream is yet another phenomenal product by LUSH. The smell is so refreshing- it is a mix of lemon and orange essential oils mixed with an infusion of garden flowers (larkspur, honeysuckle, marigold and cornflower). It is made with glycerine and cocoa butter which is excellent to moisturize dry skin and keep it feeling soft and hydrated. It was interesting to learn that the Ring of Roses Buttercream is hand rolled in rose petals. I love how LUSH uses nature to create their awesome line of produccts. I used this on my legs after shaving and love how soft it made them feel. It is best to keep this one chilled because it will melt if left close to a heat source. It is sold by the pound and costs $9.95 for a 1/4 lb. LUSH Cosmetics is a global company so please check their website to find a store near you.